Our clinic was established in April 2007 as an independent clinic for cancer radiotherapy, an entirely new form of medical institution. We have performed medical treatment of 1907patients (cumulative total number of patients undergoing treatment: for the period of April 1st, 2007 through March 31st, 2012) so far. Since its foundation, we have proactively carried out high-precision radiation therapy for recurrent cancer in addition to standardized treatment such as intensity-modulated radiation therapy of prostate cancer and stereotactic radiotherapy of early primary lung cancer. Since our start, the attitude that reflects our motto, “do our best for difficult cases not easily treatable” has been gradually recognized by local oncology specialists. We accept quite a few patients referred by university hospitals and designated cancer care hospitals. 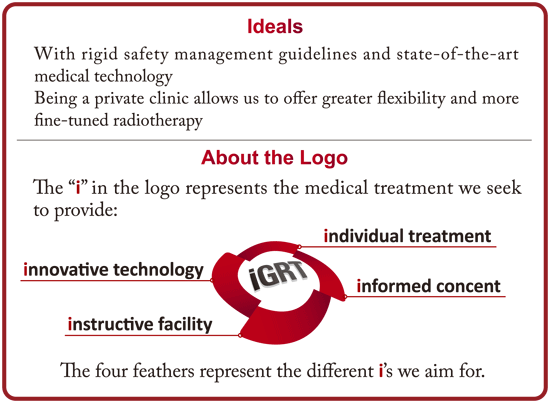 We aim to provide state-of-the-art medical techniques under thorough safety management and be a medical institution with a special role clearly different from conventional radiotherapy institutions.